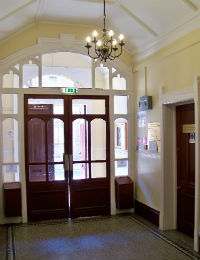 At Bakewell Town Hall it’s important to us that the building and its facilities are accessible to the whole community. Recently we’ve installed a lift to the first floor so that if you use a wheelchair, or pushchair or just find stairs a bit of a struggle, you can be a part of all our activities and events. On the ground floor, we have fully-accessible bathroom facilities and our doorways are spacious and wide. Entry from the street is level, with no steps. We’ve tried to make sure the building is welcoming and we also have an induction hearing loop on each floor. If you have any concerns, or indeed, suggestions on how we can improve access for everyone, please do get in touch- it’s your Town Hall. We’ve also tried to make our website as accessible as possible. We’re very proud of our website and we’ll continue to do our best to be easy to use. If you have any difficulties or suggestions how we could do this better, please do contact us.